A high-top training shoe inspired by Dwayne "The Rock" Johnson? Sign us up! The Project Rock 1 is a high-top training shoe that was constructed by Under Armour with the help of Dwayne “The Rock” Johnson. 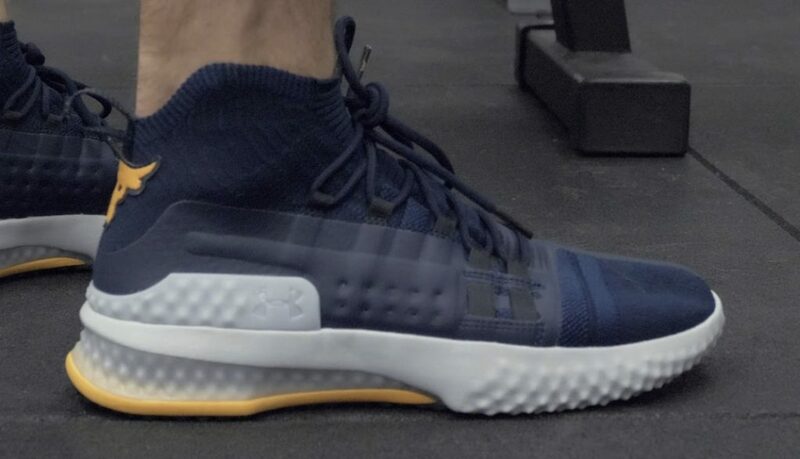 Of all the lifting and cross training shoes we’ve reviewed to date, the Under Armour Project Rock 1 is definitely one of the most unique models we’ve tested. This model features unique Dwayne “The Rock” Johnson and is the perfect shoe for the die-hard fan and training enthusiast. Instead of running the same cross training shoe tests we normally perform, we modified some of the tests to accommodate for this shoe’s main purpose, which is functional training. The key takeaway of this review is if you love The Rock, then you’ll love this dynamic and stable training shoe for multiple workout needs. The Under Armour Project Rock 1 features a high-top knit bootie design and responsive Micro G Foam midsole. The outer construction of the Project Rock 1 contains a few different components. The two main materials that make up the outer construction include an elastic knit material that provides a compression-like fit and a synthetic overlay. On the toe, these materials are split and the medial portion of the toe is covered by the knit and the lateral side includes the synthetic overlay. The full mid-foot is covered by the synthetic overlay and has a rigid texture to provide additional support and resist abrasion and early breakdown. The high-top heel is constructed with the knit and stretches up above the ankle to provide additional support. 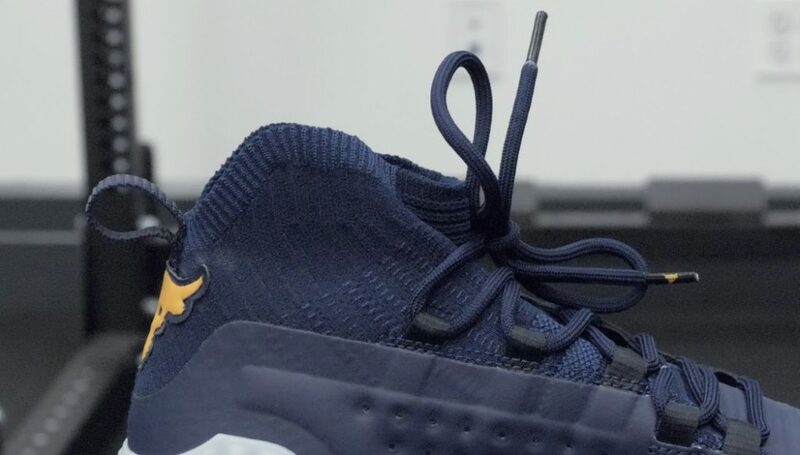 On the posterior side of the heel, there’s a stitching cutout of The Rock’s signature branding. There are five loop-like eyelets running up the mid-foot of the Project Rock 1. Each eyelet has a reinforced piece of material that spans from the bottom shoe to the mid-foot, and you can see the material more prevalently on the bottom two eyelets. The loops do a pretty great job at providing the mid-foot ample stability when pulled tightly. The only real issue that comes with these laces and their format is at the bottom of the mid-foot. Since this shoe is made with a bootie design, the material under the laces is also constructed with the compression-like knit holds the foot stable, but also provides maneuverability. The heel of the UA Project Rock 1 is designed with multiple components that provide a stable, yet reactive base. There’s a TPU layer towards the bottom, a layer of Micro G® foam in the midsole, and a plastic heel counter. The culmination of these three provide this shoe with a decently firm heel to workout with. The midsole of the UA Project Rock 1 is one of the star players of this model and comes in the form of full layer of Micro G Foam. 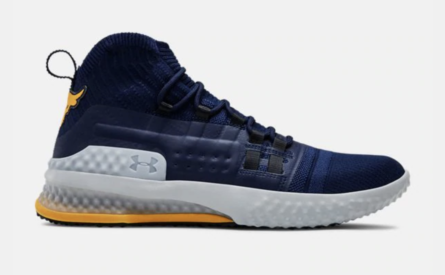 Under Armour uses the material in a lot of their training shoes, and used Micro G Foam in the midsole of their UA their TriBase Reign cross training shoe. The outsole is constructed with a rigid layer of rubber and the Micro G Foam. This diversification of material provided the shoe with an interesting mixture of reactivity and grip on multiple surfaces. In respects to the UA Project Rock 1 and its performance, I changed up our battery of shoe tests slightly for this model. Similar to our other cross training shoes, I was concerned with three major components for this model. The first attribute I looked at was this the shoe’s stability (outsole and midsole) and its ability to support weight when under a barbell. The second component included the shoe’s maneuverability and breathability (outer construction). Lastly, I assessed how shoe shoe perform on a day-to-day basis during my commute (I walk around 3+ miles each day). Below, I’ve included a quick synopsis chart of some of the consistent movements I use to assess the three above characteristics. Every category receives a 1-10 score with 10 being the best of the best for a section. The UA Project Rock 1 may not be the best shoe for squatting max weight, but it’s an exceptional shoe for casual bodybuilding and functional fitness workouts. One of my favorite performance attributes of this model is the outsole and midsole, as they both offer a ton of responsiveness to jumping and agility workouts. Also, I was a fan of the bootie design and the comfort it promoted, even when wearing shorter anklet socks. 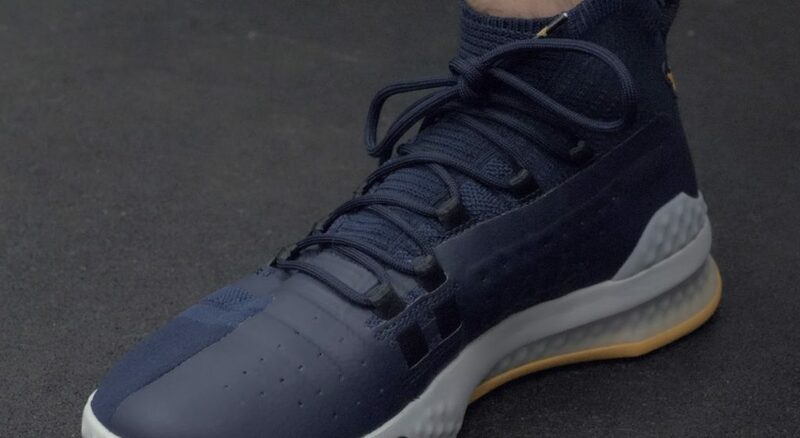 In my opinion, there weren’t any immediate drawbacks with this model’s performance other than a little bunching of the laces towards the bottom of the mid-foot and the shoe running slightly large. When the laces are pulled fully tight, this shoe does have some overlap of material, but it didn’t impact performance. In all of our tests, the UA Project Rock 1 never displayed any glaring issues with durability. The midsole and outsole didn’t show any major issues in the form of lipping or breakdown, and the outer construction did a fair job at maintaining its true size. The only concern we have for long-term durability of this model is the knit bootie design and its ability to resist stretching out. In regards to price, you can expect to pay around $120.00 for the UA Project Rock 1. Is that price fair? It depends on what you’re looking for. If you want a shoe for bodybuilding, casual workouts, and love The Rock, then I think the price fits the bill. Conversely, if you need a budget cross training shoe, then you can probably save a little by shopping around. Overall, the Under Armour Project Rock 1 performed pretty consistently across the board in all of our tests. We altered our tests slightly to accommodate for this shoe’s main functionality, and the shoe held up to our asks. If you’re a fan of The Rock and like high-top training shoes, then the UA Project Rock 1 might be a great fit for you!